In a day and age where we donate money, vote for the next American Idol and take SAT and LSAT tests all from our computers or on mobile devices, it begs the question of when we will be able to have online voting in the general elections? There are many benefits to argue for online voting including increasing voter turn out because of the convenience. Just think if you could wake up, roll over, grab your iPhone and in a matter of seconds, cast your ballot for the next president, all without getting out of bed! But let’s take a look at the disadvantages of the current voting process and why online voting could have security implications of why an online voting system may not be a short term solution. The current voting process involves looking up your precinct or district then finding your polling location, taking time out of your day to go to the nearest poll and get there during operating hours, hoping there isn’t a long line when you get there, check in, receive instructions and then actually voting. I’m exhausted just thinking about it. Granted, I have voted in every election since I was old enough to vote, however I am fortunate enough to have a mode of transportation and a flexible schedule which allows me to overcome the obstacles that would otherwise prevent me from getting to the polls. The majority of voters, especially young and old, don’t take the time, have the means or are just too lazy to go through all that effort, and I can’t say I completely blame them. Secondly, online voting uniform the ballots from state to state making it easier, faster, and more accurate to tally votes using an online system. At the moment, there are a number of different ballot types from punch cards to penciled in forms, to electronic stations. Although technology is sophisticated enough now to eliminate paper, the electronic machines are expensive and require a learning curve, even for someone like me who is a pretty tech-savvy person. The punch card and pencil ballots have been ridiculed for being confusing and then there are absentee ballots which can get lost in the mail. Hey Florida, Remember the Vote Recall of 2000? Do you recall the 2000 Presidential elections and the recall of the votes in Florida? Hundreds upon thousands of boxes of paper ballots had to be transported across the state, after they had already been counted by hand once, to then be re-tallied by official personnel who have been trained but are already overworked and exhausted. Think of all the margin of error that could occur between all variables in that situation. Internet voting would minimize these error factors, making the system more efficient and streamlined. But despite all the benefits, there are plenty of downsides to online voting, primarily security and identity theft concerns. Who is to say Joe Schmoe isn’t hacking into your computer and voting on your behalf? Trust us, we aren’t the only ones who have had this brilliant idea or thought about the security implications of an online voting system. The National Institute of Standards and Technology in the U.S. Department of Commerce put out an electronic voting report in February 2011 which takes an in-depth look into this idea of Remote Electronic Voting and the Security Considerations of the Uniformed and Overseas Citizens Absentee Voting Act (UOCAVA). And by in-depth report, we mean 60+ pages. In the report, they mention a number of different threats to the online voting system including confidentiality, integrity, authenticity and availability on the contrary and for those who don’t have access to computers or mobile devices. For those who do have access to the internet, they say that an emerging threat is “malicious software infecting computers, giving attackers control of these systems.” And, according to researchers from the Georgia Tech Information Security Center “it is estimated that attackers may control 15 percent of online computers in this way”. Pretty scary if you think about it. The report goes into the more specific types of threats including internal and external threats and details about each of the type. They conclude that although there are a myriad of new technologies that can mitigate the potential threats, the possibilities are too high and the outcome is too important to risk something as valuable as determining the future of our country. Long story short, we shouldn’t hold or breath or count on internet voting anytime in the near future. I can hope that the technology will be advanced enough one day to overcome the barriers that prevent online voting from becoming a reality. But until then we should be assured and trust that we have the safest and most secure election process (read the report if you want to better understand the security risks of online electronic voting in the U.S.), no matter how archaic and cumbersome it may seem. 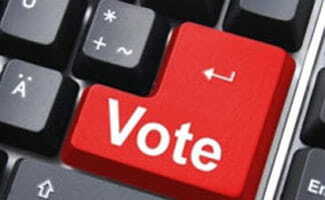 What do you think about online voting? Are you for or against it? If the option were available to you, would you feel safe and secure enough to vote online? No matter your opinions or what the system is in your area, make sure you do your part to have your voice heard – go vote!